In Quebec, there are many opportunities to get involved in the protection of our natural heritage. From the Barachois of Malbaie in Gaspé, to the Ottawa River, you can lend a hand in the conservation of the province's important natural habitats. 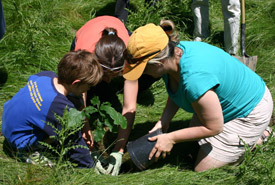 The Nature Conservancy of Canada's (NCC’s) Conservation Volunteers program engages people in the protection of Canada's biodiversity. Our events are carefully designed to ensure your volunteer time is dedicated to critical conservation action. The Conservation Volunteers program offers opportunities to join staff on projects that contribute to the long-term stewardship of ecologically significant properties owned and managed by NCC, and our partners. If you wish to volunteer with NCC in Quebec, please fill out and submit our volunteer application form. The Quebec Region’s Leaders in Conservation (LIC) program has been developed for a special group of NCC supporters who donate $1,000 or more per year. Leaders in Conservation have access to an array of privileges that allow them to live the NCC experience to its fullest. This may include field trips to exceptional sites and invitations to interact with individuals who dedicate their lives to conservation. During their active season, from May to October, turtles are on the move to search for food, find new habitat, look for a mate or lay eggs. Unfortunately, travelling on land and crossing roads has its share of risk for turtles, as it makes them vulnerable to collisions or disturbance. This is why the Carapace team needs your help. If you spot a turtle, let us know by filling out the form at www.carapace.ca.